Ultimate Alarm and Protection System for your Mac. Is there a better alternative to myBookAlarm? Is myBookAlarm really the best app in Security category? Will myBookAlarm work good on macOS 10.13.4? myBookAlarm helps you locate and recover your stolen Mac by periodically sending its current location and IP Address - thus you can locate your stolen Mac within a range of some feet. myBookAlarm can't prevent your Mac from everything - but it will scare off potential sneak thieves and protect your important data. And should your Mac really get stolen - myBookAlarm can help to identify the thief, prevent him from selling it and can help you to get it back quickly. myBookAlarm needs a review. Be the first to review this app and get the discussion started! myBookAlarm needs a rating. Be the first to rate this app and get the discussion started! In case of an alarm you will immediately get an email and SMS notification containing a mugshot taken with the iSight camera and if you've enabled the 'stealth mode' on a restricted guest account - myBookAlarm will periodically send its location, IP address and screen shots - thus you can see what happens on your stolen Mac and tracking it down is a piece of cake. 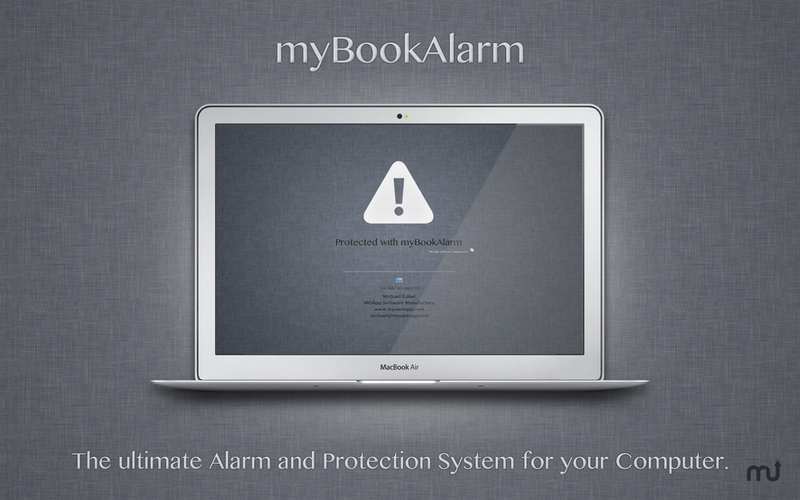 Of course myBookAlarm can't replace horse sense and you have more to do to protect your Mac. In the help and manual you will find detailed information on how to properly setup myBookAlarm and what else you can do to secure your Mac. Protect your beloved Mac and your important data from unwanted access and theft on the fly or by hand - to scare of potential sneak thieves or nosy roommates and colleagues. Get notifications by email and SMS message in case of an alarm. In stealth mode myBookAlarm will periodically send additional screen shots - thus you can see what happens on your stolen Mac. Opportunity makes the thief. So why don't directly signal that you're prepared and that they won't have any fun and use with your beloved Mac and that their face may end up on Facebook and Twitter and they may also end up in an orange jumpsuit collecting waste.